People often talk about bread making as a bug of some sort that people catch. Well, I’ve definitely caught it, and in an effort to move up a rung on the artisan bread making ladder, I made a batch of bagels. This isn’t a quick recipe. You need to time things carefully so that you’ve got your bagels ready at the appropriate time, which is obviously Sunday morning. Preparation is key, and good things come to those who wait…if I could cram another cliché into this sentence, I would, but you get the idea. There’s some method and a bit of science underpinning this extended process. Dough develops flavour over time, and the longer it gets in the rise, the better the flavour. This is why supermarket bread doesn’t taste of much at all – it gets no time at all to mature or develop, because the aim is to get it on the shelves as quickly as possible. This recipe demonstrates brilliantly why slow food is very often good food. The big trick here is that the bread does its rising in the fridge, which retards the action of the yeast, allowing the dough to mature whilst controlling the rise. This lets you leave the dough alone to do its thing while you go off and do yours. The interventions needed to execute this recipe are small and spaced widely apart, so it isn’t as disruptive as an eighteen hour recipe would at first appear. So, start at lunchtime on Saturday. Measure 450g of unbleached white bread flour into a large bowl and add a tablespoon of honey, a teaspoon of instant yeast (that’s 3g, or half a normal packet) and one and a half teaspoons of salt. Mix together and add 255g of lukewarm water. Yes, that’s grammes…weigh your water. Use a large spoon to mix everything together. Keep mixing for about three minutes until the dough forms into a stiff ball. Let it rest for five minutes and then knead for three minutes until the dough is smooth. It should feel stiff but still flexible. Put the dough into a lightly oiled bowl and cover with cling film. At this point, you can either let the dough rise for about an hour at room temperature, or put it in the fridge to rise for the rest of the afternoon, which is what I did. When the dough has risen, at some point in the evening, it’s time to shape the bagels. Divide the dough into six equal chunks and roll out a chunk into a sausage shape about twenty-five centimetres long. Wrap the dough around your fingers and press the overlapping ends together very tightly, before working the dough in your hands to even out the thickness. The bagel’s hole should end up about five centimetres across. Don’t use any extra flour to do this – if the dough stick to the work surface, just wipe the surface with a slightly damp cloth and try again. Lay the bagels on a well oiled baking sheet as you form them, and when they’re all done, cover the sheet with cling film and put it into the fridge. Leave it there overnight. The next morning, you’ll need to be up relatively early, but your only job is to lift the baking tray out of the fridge, then you can go back to bed for an hour and a half whilst the bagels warm up a little. The next step is important, and tells you if your bagels are properly risen. You need to dunk one in a bowl of water, to see if it floats. If it does, you’re good to go, but if it doesn’t, leave them for another fifteen minutes or so. You need one bagel to pass the float test. A bagel needs to be either steamed or poached to make it into a proper bagel and to give it its characteristic crust. Dissolve a tablespoon of baking soda, a tablespoon and a half of honey and a teaspoon of salt in a pan of water that’s at least ten centimetres deep and big enough to hold at least three bagels at once. Bring the water to the boil and let it gently simmer. Carefully lift each bagel from the tray and slide them gently into the water. Try to handle the dough as little as possible, so that you don’t knock it back too much. Poach for about a minute before flipping each bagel over for another thirty seconds. Lift the poached bagels out with a slotted spoon and put them back onto the oiled tray. 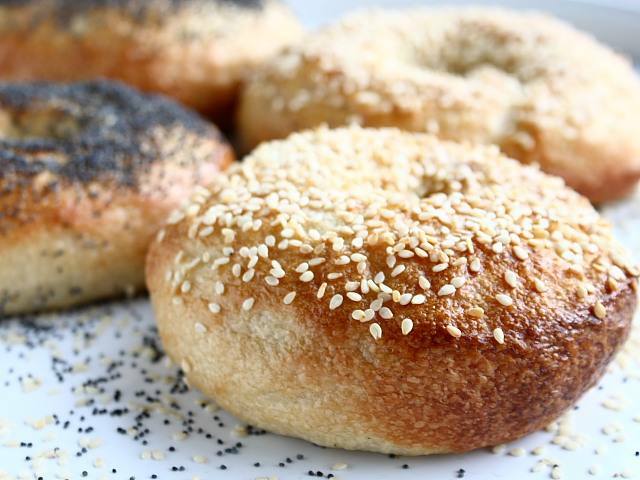 Once all the bagels are boiled, top them with either poppy or sesame seeds and bake them in a very hot oven (230c) for eight minutes. Rotate the sheet and continue to bake for another eight minutes. Keep an eye out to check that there’s no burning or excessive browning going on. These bagels are the absolute real deal. They knock the spots off the slightly stale tasting specimens that you buy by the bag from the supermarket. Yes, it’s all a bit of an ordeal making them, but it isn’t difficult, and there’s much to be said for simply doubling the recipe and doing a batch of twelve and freezing the ones that don’t get eaten over the Sunday papers. They look amazing pal, I think it's worth a go to try the real deal. What did you have them with? 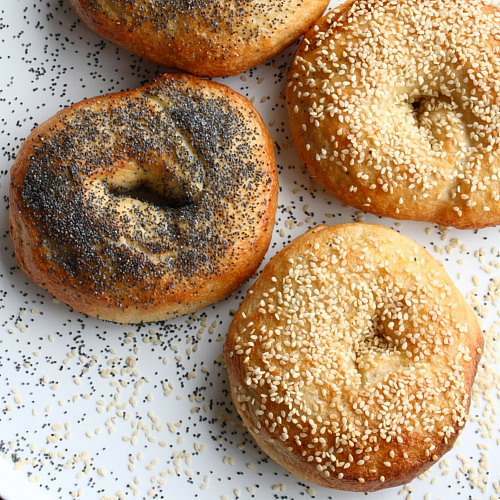 Bagels can be challenging, but are worth the effort. Supermarket bagels are not really bagels. Thank you for that tutorial – now I feel a bit more confident to go and give these a try. Thank you so so much for sharing. I have been trying to make bagels forever. I never realised there were so many steps to making bagels – but I'm sure the end result is worth it! I never baked bagels. I'll give a try. thanks for sharing this delicious recipe! I literally can not wait to make these! These look so good it's ridiculous. Homemade bagels are one of my favorite things in the universe. Bagels are sooo worth the effort! 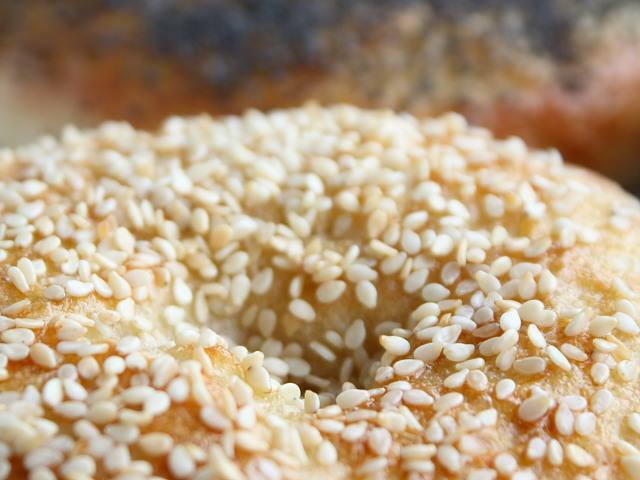 Your bagels look wonderful – I can almost smell the sesame seeds! fantastic post and photography! You're correct about the "bread-making bug"…It starts to consume your life/free time. But I must try these bagels. Those look amazing! I’ve been craving bagels forever and this just made me want them more.